A man has been charged with robbery in connection with an attack on a man in his 70s and the theft of his van. Andrew White, 30, of no known address, was located and arrested just 13 minutes after the victim called police on Tuesday (May 17). The victim, a man in his 70s, called police at about 2pm, saying he was in Lime Tree Avenue and a man had just pushed him to the ground, got in his van and driven off towards Cromwell Road. Officers were deployed and located White in Bright Street, where he was subsequently arrested on suspicion of robbery. 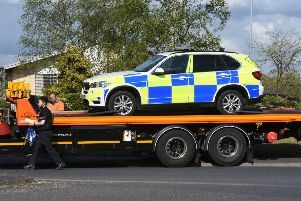 He was taken to Thorpe Wood Police Station where he was charged with robbery and remanded to appear at Peterborough Magistrates’ Court yesterday morning (Wednesday, May 18). He has since been remanded to appear at the same court on June 15.